Before I quite get underway on this review of Nick Park’s wonderful characters Wallace and Gromit’s latest adventure, I just wanted to place previous outings in context so that the reader will be able to approximate the way I reacted to A Matter Of Loaf And Death. Famously debuting in director Park’s film school graduation piece, celebrated stop-motion studio Aardman saw the value in the characters and offered its support in the short’s completion, also guaranteeing the young creator-animator a full time position at the company. Aardman had always enjoyed immense success in short film and television production, but Park’s arrival mirrored John Lasseter’s involvement with Pixar in that both young men brought with them a unique vision that would elevate each studio to loftier and loftier heights. Indeed, once Park’s wide-mouthed creations became a hit – confirmed with an Oscar win for his follow up Creature Comforts – the toothy grins practically became nothing less than Aardman’s in-house trademark style. The film was of course A Grand Day Out, with Wallace & Gromit being two characters that mean a great deal personally to Nick Park. It was a shorter than we have become accustomed to film, running under 20 minutes, less than the later standardized half-hour format or, obviously, their feature film, though taking the longest time – a dedicated seven years – to make. 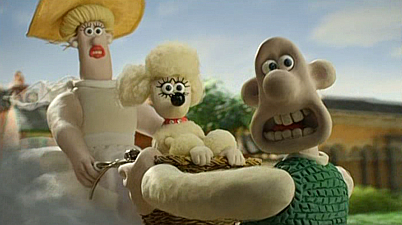 The film shows its rough edges in comparison to the following productions: the storyline centers almost exclusively on just Wallace the inventor and Gromit his much put upon and very intelligent dog (originally Park considered a cat) who manages to save his master from a great many perils, and the location (the moon) seems to have been picked for its simplicity. This by no means suggests the film isn’t as enjoyable as the others: what A Grand Day Out lacks in polish it instead rewards with some brilliant humor and, of course, two very original characters that play very cinematically on screen; a sort of modern man and best friend Laurel & Hardy, by way of Buster Keaton. Dialogue, provided by Brit sitcom legend Peter Sallis, plays a very important part in Wallace’s warmth, but it’s Gromit’s silent exploits that regularly steal the show. With Park’s Creature Comforts Oscar win in the bag, even better was to come in The Wrong Trousers, given a lavish television special budget by the BBC, who commissioned the featurette. The film received lots of hype on its debut, with an equally long half-hour peek behind the scenes, Inside The Wrong Trousers, providing a glimpse into the Aardman factory. The Wrong Trousers is rightfully an animation classic, and was the production that really introduced Wallace & Gromit to the world. Given a limited theatrical run with a batch of other prestigious Aardman animations, Park’s second – and much more accomplished – adventure was eligible for Oscar consideration, its win confirming again Park’s position as a major name in the business and proving to help make the Studio an attractive partnership proposition for a Hollywood company. The film literally ups the ante for both Wallace & Gromit’s perilous situations and the finesse Park and his considerable animators bring to crafting the sets, props and finished scenes. Though it also won an Academy Award the hotly anticipated A Close Shave, which followed just a couple of years later, didn’t quite surpass the sheer wit, invention and imagination on show in the previous two films for my money, especially The Wrong Trousers. There were some perfectly genius touches, of course, but in many ways it felt like a retread of The Wrong Trousers and lacked the true spark that had made Park’s other films something special. 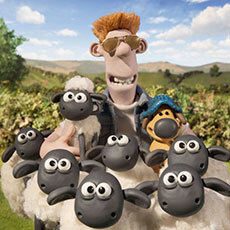 Technically, things were top-notch, and the achievements made in the stop-motion animation were deservedly recognised with its award win and the birth of a new break-out star: scene stealer Shaun The Sheep went on to feature in his own series! Aardman also went from strength to strength, and a feature film deal with DreamWorks not only allowed them to go international with Chicken Run, putting the Studio behind only Pixar in storytelling prowess, but had the Hollywood heavyweights insisting on a Wallace & Gromit movie as part of the deal. That would come in The Curse Of The Were-Rabbit, which successfully managed to not feel like one plot stretched out or, indeed, like three half-hours stitched together, providing a really involving feature outing for the pair, supported by some fine comic turns by big names Ralph Fiennes and Helena Bonham Carter. The Curse Of The Were-Rabbit isn’t quite perfection – it just begins to lag as the climactic moments kick in to save it and the original, hugely pun-tastic title, The Great Vegetable Plot, was much more appropriate – but as a feature length transference of two characters perhaps better suited to their more comfortable half-hour contrivances, it almost reached the heights of The Wrong Trousers, though nothing Park or Aardman have come up with since has yet matched the sheer brilliance of Feathers McGraw! And so – still with me? – to A Matter Of Loaf And Death, which I still think should really have been A Matter Of Loaf And Bread for maximum effect! Although W&G did pop up in a series of Cracking Contraption spots (almost the equal of a new short themselves and ostensibly promoting the characters for the feature), this new film comes after a period of relaxation for Nick Park, who took a break after the Were-Rabbit feature film and sat out, for the most part, Aardman’s eventual breaking up from DreamWorks over the collaborated project Flushed Away (which deserves much more credit than it gets), Loaf And Death finds Park – and Wallace & Gromit – refreshed and ready for more adventures. Co-penning the screenplay and taking sole direction credit, Park’s hands-on approach is clearly felt: Loaf And Death follows in the footsteps of the previous films in tone, style and wit, now finding our titular pair hard at work running their own bakery, Top Bun, offering delivery “from dough to door”! It starts off in classic Hammer Horror film fashion with a death – well this is a murder mystery after all (a “who donut?”) – at the hands of a serial (or should that be “cereal killer”!?). For all of W&G’s hazardous adventures this is the first really for real human fatality I can think of in the series, but it’s done in that mocking style – death by rolling pin – that slightly overplays things to good effect (actually more “shocking” is a glimpse of Wallace’s…um…backside later in the featurette)! We first catch Wallace in traditional style, being woken up and dressed via a collection of concocted gadgets – is it me or does Wallace actually look younger every time they make one of these? He must have been working out since going Hollywood! It seems the cereal killer is on the prowl with a grudge to bear for the town’s bakers, a situation not bringing any less danger to our heroes when Wallace begins to fall for the charms of femme fatale Piella Bakewell – who naturally spells trouble that only Gromit can see! Without the possible tampering or having to mind any bigger studios’ production notes, Park is able to return his creations back to basics, putting together some wonderful moments that will please the duo’s many fans, as well as a hearty big laughs that should convert any newcomers; a comically risqué highlight involves a simple edit cut between Wallace and Piella’s flames of passion begin to alight and a shot of the loaves rising in the oven, and a pastiche of that scene in Ghost is so suggestive it’ll have adults absolutely rolling over in laughter. With the movie really forging things forwards in terms of what could be gotten away with in the W&G films, there’s a definite, if slight, shift in Loaf And Death towards showing Park’s dark side: like the best family films, when it needs to be scary it’s not afraid to be, providing some heart stopping thrills amongst the comedy. The title itself alludes to the old film charm, even going as far as to sprinkle a few (intentional) film scratches on the text as it blazes upon the screen, and it’s a measure of how recognised both Park and his leading voice Sallis have become in their respective arenas: both take up-front onscreen credit here. Gromit, of course, needs no words, but he does seem to “speak” to the audience more than usual, breaking the fourth wall to raise his eyebrows at us at any available turn. Wallace & Gromit have become hot commodities in themselves; the publicity surrounding their return in the UK coming complete with somewhat tenuous branding opportunities that have seen them selling Kingsmill bread and heating systems! In interviews, Park has revealed Loaf And Death is the first W&G film to be shot digitally, on SLR stills cameras, and it certainly looks as impressive and cinematic as ever. The animation, especially the computer controlled camerawork, and (some CG) special effects are particularly impressive – wonderful little touches that add so much even if they are mostly “invisible”. There’s a very fine use of the animator’s fingertip marks on the clay to produce the illusion of wind in Wallace’s arms and trousers during an exciting rescue early on. Best of all, and a result of the stop-motion process taking that much longer and so allowing for extra thought, are the designs, packed with the usual Aardman freeze frame moments – who knew Feathers McGraw was missing!? Could he pop up again in a future adventure? Let’s hope so! The backgrounds hold more treasures: a “Citizen Canine” poster for instance, and tons of doggied -up titles: “Pup Fiction”, artefacts from previous films and stop-motion history (including Oliver Postgate’s Bagpuss) and, of course, there’s only one song Gromit and his new found beau Fluffles could fall in love to: Puppy Love! But Loaf And Death isn’t all successful: while it does rattle along without any fat on its lean bones, this is also where it may fall slightly short – it’s a bit choppy, being lots of very inspired fillings but not adding up to a particularly awesome sandwich or indeed anything we haven’t seen before. Piella herself isn’t totally accomplished – not only is she a little too close to being moulded in Wendolene fashion (from A Close Shave), but there isn’t too much to her personality, even if Coronation Street soap veteran Sally Lindsay plays up the histrionics perfectly to a tee. Then again she is here to serve a purpose, and kudos to Park and suitably named co-writer Bob Baker (amusingly referred to in the opening) for not attempting to stretch out the obvious and keep the Bakerlite girl twist bubbling for too long, though her pet Fluffles isn’t too far off Shaun The Sheep herself in her poodle design. The whole thing also plays at such high tension that things don’t feel particularly amped-up for the inevitable showdown, the high speed train set chase between Gromit and McGraw in Wrong Trousers and the high flying rescue in A Close Shave going untouched by the fairly routine bakery bust up here, through top marks for Wallace’s best ever line, “Gromit, I’ve got a bomb in my pants!”, just before the inevitable shot of his own “buns”! Adding to the fun is the scoring, and Julian Nott’s music is as bombastic as ever, full of terrific orchestral stabs, and in the production design sly spoofing seems to be the order of the day: everything from airlines (“Cheesey Jet”) to shoe fashion (“Poochi”) finds itself a gently aimed target. Coming thirteen years – wow – after their last TV outing, and twenty years after their first appearance, A Matter Of Loaf And Death finds the inhabitants of 62 West Wallaby Street in classic, if not exactly top, form. It’s nonetheless a fine welcome back for the quintessentially British man and his dog, in a fun adventure that brims with all the elements we’ve come to enjoy so much in the Aardman productions. The half-hour small screen (now wider at a 16:9 ratio) is arguably the rightful home for Nick Park’s lovable pair, though the big screen aspirations are never forgotten: not only are we treated to a barrage of movie references (as well as Ghost, from Jaws, Batman: The Movie and Aliens, to The Matrix, Mission: Impossible and Indiana Jones And The Temple Of Doom via such oddities as The Man With Two Brains), but the quality level from the tiniest props to the escapism of the climax, spills from the screen as impressive as any blockbuster. We’ll no doubt see Park back in Los Angeles to enjoy another Oscar nomination, but though he may not take away a win this time, A Matter Of Loaf And Death is a cracking slice of wildly inventive action! Wallace & Gromit: A Matter Of Loaf And Death officially premieres on the BBC One and BBC HD channels on Christmas Day in the UK at 8:30pm. The 20th Anniversary exhibition A World Of Cracking Ideas opens at the Science Museum, London, in March 2009.